Satisfying appetites wasn’t all Grace and David Mable had in mind when they opened an eatery in Biltmore Village last fall; customers can also partake in great reads. At Books & Breadboard Café, where breakfast and lunch plates are served simply on bamboo breadboards, more than 3,000 tomes line the shelves. A chef for more than 30 years, David oversees the menu. 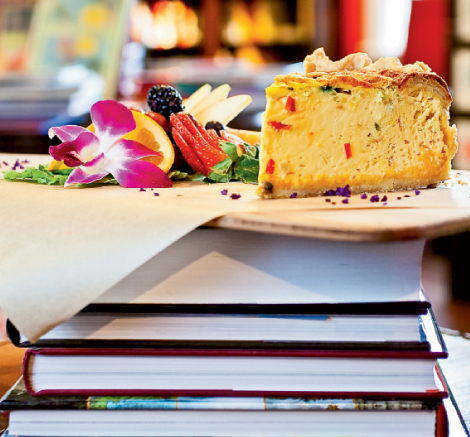 The four-inch-thick, veggie-packed Mile High quiche, cinnamon-orange French toast, and huevos rancheros are among the morning offerings you can dig into with a book in hand. For lunch, barbecue pulled-pork, roasted hummus with portobello, and Italian sub sandwiches are served with chips and David’s Deco Slaw—a colorful mélange of squash, cabbage, carrots, red peppers, and zucchini. The bookstore, which harbors book club meetings, poetry readings, and a castle-themed children’s area, is Grace’s passion. There’s a collection by local authors, and the titles cover topics ranging from gardening to personal inspiration. Grace is happy to recommend a book, or you can consult the board for weekly top 10 picks, such as The Paris Wife. Never fret if you don’t get to the last chapter before you finish dining: You can add the tale to the check and take it home for dessert.